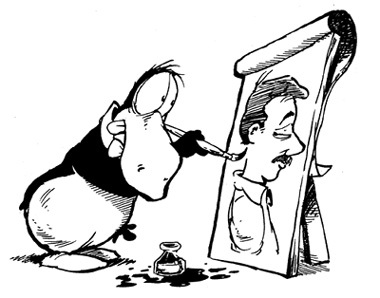 Berkeley Breathed is the Pulitzer Prize-winning cartoonist of Bloom County, Opus, and the author of many children’s books. This is the second part of a two-part interview. The second part is available here. Condition of Mr. Segundo: Jittery of Gittis. Subjects Discussed: The disparity between illustrating a daily strip and audience reaction, blond-haired boys named Milo, The Phantom Tollbooth, literary references in Bloom County, receiving a onionskin letter to Harper Lee, picture books and moral dilemmas, film influences, the importance of fun background details in illustrations, foreshadowing, how screenwriting has shaped Breathed’s storytelling, the strengths and weaknesses of moving from hand illustration to Photoshop, pink and purple color schemes, 300, self-editing vs. producing art, beating the procrastination impulse in middle age, chasing the FedEx truck during the Bloom County days, the infamous Opus couch strip, on not being able to get away with certain forms of humor in today’s newspaper age, the generational gap between print and digital, and trying to lure younger readers to the comics page. Breathed: Certainly, in the ’80’s, when I had fifty to seventy million readers, it was virtually impossible to put it in context that meant anything. And it begins to happen when you go from city to city and you meet people and they talk about your work in ways that you don’t think about it yourself. And it puts it into a different kind of context and it’s good. Because you come back home with a renewed sense of responsibility in some ways. Without getting maudlin about it, you do not take it for granted sometimes, as often happens, when there’s a lot of deadlines. Things almost become rote. And you forget that there are people waiting to read it and what they read, they take very seriously. Even in a funny way.